Oh T... I am ((((((((((HUG)))))))))'ing you right now. I hope that you take some small solace that you get to come on this board ANYTIME you want and talk to people and even check in on Bear and how things are going with him. What a horrible horrible situation to be put in! But this woman sounds incredibly unreasonable and was just looking to hurt people without giving a single thought to the Fuzzy One at all!!!! This is a tough situation to be in, but it's good that it all worked out. I wish all the re-homing cases that came here could work out so well. I had a crazy GF once who was so jealous of Marshall, she would just go on and on with all these "what if?" situations about Marshall and what I would do "if". I got a few doors with holes in it from these conversations. Well, this is going to be a tough road to hoe... mainly because of the connection between T and Bear...and her family. Bear needs time to adjust without dog thoughts that he is going home with Mommy when she comes to visit this weekend as she wants to do with her daughter... he so obviously misses her that even her voice on the answering machine gets him all upset... looking around for her. I can do this, but I need some time and some space to do it. I so totally understand missing him that I would give him back to wend the fates as I don't really feel like he is mine yet...like its not my decision to make. But, if I am to do this, and if Bear is to survive, then we need some time. Time. Bear needs time. I need time. We have to have a chance to get used to one another. Bear, by his very nature, is faithful to his T and family. Its a trait I would hope to have turn towards me, sooner than later. If it isn't working, he will go back to T.
I want what is best for Bear. Please, give us a chance. I took Bear for a walk this morning before I went to work, a short one. This evening, we went for a walk together that is a path through the woods...and he loved it, and at one point, was nuzzling my leg. When we got back, I put him outside on a lead, and he was smelling the air for T...whining. Not much, but enough for me to know. When she called this evening, he immediately got up and whined, looking around. Bears misses you T. Deeply, as much as you miss him. Its your choice on this. You have to give us time. I understand if you can't, but I can't do that to Bear. I can't tell you this in person. I'm not strong enough to deal with you both. My own pain is too recent. I leave this choice up to you and understand whatever you choose. No hard feelings, but Bear needs you to be strong. Now. Oh A! That had to have been so hard for you! It seems that just your very nature is as a care taker and you want everyone to get what they need to make this time easier... its so hard that taking care of both of those needs from the seperate individuals are conflicting things. I know it must be incredibly heartbreaking for T to have to have given Bear up, and to perhaps not see him right away and know that he is okay... but from everything she said, all she wants is what is going to be best for him and I think she will be willing to make that sacrifice for him and for you as well so that you two can have your bonding time. 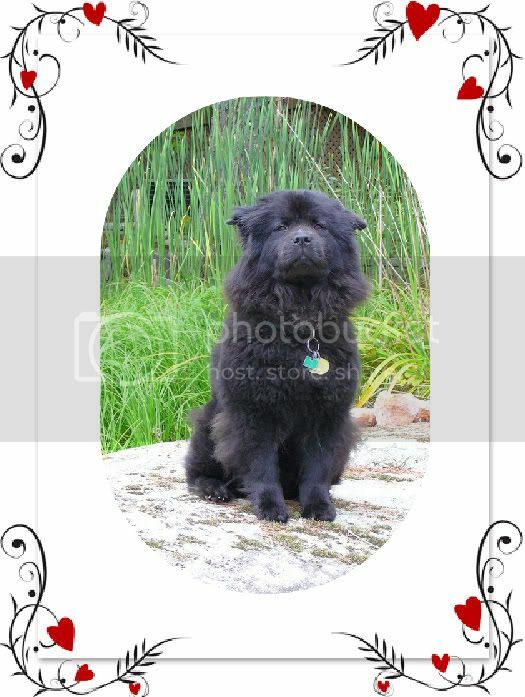 Chows are so incredibly loyal that he must feel very displaced and nervous right now. I have no doubt that T is going to understand what needs to happen here. Ultimately all anyone in the situation wants is for Bear and you to bond and build that everlasting relationship. T... your heart must be in turmoil, and your children have to be hurting too. This loss is so great, and to keep finding reminders of him when its all so fresh... I'm tearing up while I write this for you. Allison is a wonderful woman, and you know that because I have faith that you never would have let Bear go if you didn't feel the love just POURING off her. I know that she will always be in contact with you and letting you know how he is doing and what is going on with him. You are amazing for being so selfless and letting him go in order to save him. There are 3 amazing heroes in this... You, Allison, and our champion BEAR!!!! T - Know that I am crying right now as I write this... I know. I know. You have my address, you can send stuff there. Especially meds, which I guess we didn't get to discuss in the emotion of the moment...should, definitely, and will. Right now, T, he is laying behind me doing his snore, you know the one...which I didn't hear last night. He is allowing me to come up to him from any direction and hug and pet him...which I take every opportunity to do. He's not ignoring me anymore. The cats are still standoffish, but once the three of them make the necessary trust maneuvers, I think Bear will feel less like a stranger in a strange land. I plan on taking him with me all weekend, and hopefully he won't decide that the car is the best place next to heaven this time, to stay in when we get back home!!! lol! SAturday is chore day and shopping, so he will get his first introduction to the Connecticut upper valley's fine offerings! *s* And start getting used to all my regular saturday haunts. thank you for understanding T. I know how hard this is for you. I feel all too y'umon right now and don't know from heroes...but, YOU are mine! yeah crying is what i have been doing every since he left. i couldn't go to work today. My eyes were just so swollen and crying all day today didn't help and telling my kids it started all over again. I know he is in a safe place and i am sooo happy that he is making up to you. He loves going in the car. I think that everything will be okay. It is just sooo painful letting him go but, i am happy that he will get to live and has a great home and plenty of space to play. I am sure he will become your dog soon and he will love you just like he loved me. Keep writing it is hard for me but, at least i know how he is doing. This is difficult for both parties and the chow. I admire both families for trying to be fair in this. I adopted a 3 yr. old chow in Oct. last year. The first night, Mikki slept by the front door waiting for her family to come back. It broke my heart. She cried all night. Every time a car drove by, she got up and wagged her tail thinking she's going home. She sat at the door and cried for two nights. We go for walks every day, until a month ago, Mikki would walk along the sidewalk and walk up everyone's driveway sniffing. I am sure she was looking for either her previous family or her family before them. Otherwise Mikki and the two cats have made friends. Mikki is very attached to me now. She follows me everywhere. ....This story is so sad, it makes me cry. Allison, I know it's heartbreaking, but I believe you are doing the right thing. The sooner Bear can adjust and know that you are his new mommy the better for him. Bear is lucky to have you. I hope this cloud of sadness will pass soon, because you are a new mommy and deserve to celebrate your mommy-hood. Joy is just around the corner. I hope you will share it with us soon. T, bless your broken-heart. You are engaged, this is a time when you should be walking on clouds! But, instead your heart is breaking over Bear. As a mom, I know this hurts you to watch your children be sad over Bear. As if, that is not enough, the ex has to be causing you much frustration. In the midst of all of this, you have demonstrated that you are a class act. I know in your heart you are happy that Bear has found a loving home with Allison. Hopefully, when Allison shares the how much joy Bear brings into her life, it will help chase away the sadness. I'll continue to keep you, your family, Allison and Bear in my prayers. And Bear IS bringing wonderful smiles to my face... we had such a good day together today! T knows already, but we spent a few hours in the car doing my saturday chores, recycling and shopping and such...then home, lunch, the house chores, and then I took him for a lonnnng walk up to the beaver ponds and back. He is beginning to show his sense of humor to me, but also his stubborn side, but also how smart he is. I don't know if I can describe the sense of humor except that there were quite a few places along the trail through the woods alongside the beaver pond where the mud was so soft that he sunk in up past his elbows and I had to help him out by pulling on his lead...this only happened like twice becuz he tried to go in the pond. We finally found a spot where he could go in and not sink in the mud and I thought he was going to go swimming...he wanted to cool down! Afterall, it was a whole 60 degrees today!!! *s* What I found funny, humorous, was on the way back along the beaver pond, he let me lead and walked behind me, following my footsteps. No way was he going through the indignity of sinking in mud again! All the way back, he showed me how smart he was by finding the way around the fallen trees from the storm we had to skirt, himself...leading the way this time. A few times, he must have smelled a moose or a deer, cuz his ears went up and his nose was in the air. It was funny but also scary, and incredibly exhausting, because we walked by a field full of scotchhighlander cattle on the way and he ignored them, and then on the way back, he really really wanted to nose to nose with them. The problem is that these cattle are notorious for being less timid and wilder than normal cattle, with big horns, and pretty soon the whole herd of 16 plus cows and calfs were trailing us. AS I PULLED BEAR THE QUARTER OF A MILE PAST THEM!!!! I am serious! I had to pull this dog the whole way...and he is a strong, heavy dog already!!!! He wanted to play with these critters that I sensed he felt a kindred with, hairy and shaggy as they are!!! lol!!! With only a small electric wire between them and us, all I could imagine was a herd of scotch highlanders trotting down the road behind us, herding US home!!! But, since that walk, he has been especially allowing of me to cuddle and touch him, pet him and groom him, and even showing me his backside to scratch when he wanted it. He's also let me know twice that he wanted to go out. So he is connecting, and I am so happy! Its only the first whole day we have spent together! It all bodes well...but maybe I ought to get some roller skates for the scotch highlander part of the walk...*s* Me muskles are sore!!!! thank you. thank you. thank you. T.
What a wonderful day you had! You NEED to take pics of those COWS and your walks, sounds so BEAUTIFUL. what a great story to read. I am so glad he is soo happy. He is very curious and is not afraid of any wild animal. I forgot to let you know about that. I am so glad you have a great walk for him as he loves to walk and be outside. i am happy to know that he is warming up to you. yes he is very strong and stubborn when he wants to go somewhere. You will get quite a workout with him with those cows being around. That is funny about the mud. When we went for walks there was a stream and he would go in it every chance he could and just walk up the stream until he got cold and then he would get out and go back in later on the walk. we had horses and sheep where we went for walks and he just wanted to get in there with them and i had to pull him along too. it seems to me like he is doing quite well for you. i am so happy that he is not going the other way. I think he must of known what was going on the day you picked him up. The kids are okay. they miss him and can't wait to see him but i think i am a lot worse than they are and they are telling me its okay mom. funny huh. my kids are keeping me together. ha ha.. Thank you again for taking him and taking such good care of him. give him hugs for me. Aw, T, I love the way kids do that!! yeah, i am lucky to have really caring kids. They are helping a lot. He is so photogenic and such a ham! He loves his picture taken. i took a lot of them. He seems to be settling in really well. i am so thankful for that.